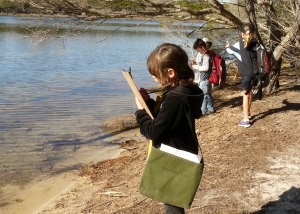 Estuary Waterwatch allows students to examine what an estuary is and why they are important. 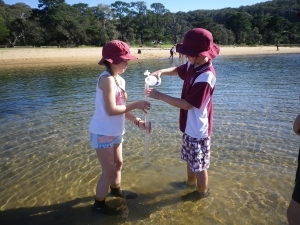 Students discuss factors that effect the estuary environment in Bournda National Park and then complete a water quality analysis and a biodiversity study. Students use water quality test kits to test pH, temperature, turbidity and salinity. They record this information on data sheets. Students then use dip nets to collect samples of estuary specimens to examine. Sorting trays are used and students are assisted with the task of identifying species. Data is recorded. Students then discuss the following questions: How can a biodiversity survey indicate how healthy an estuary is? Why test water quality? Why is clean water important? Is this estuary healthy? What factors may be affecting the health of this estuary? 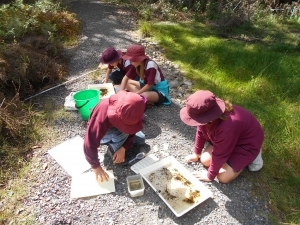 Factors that change environments allows students to investigate the way people have changed the natural environment in and around Bournda National Park. The focus is on the impact to the natural environment from land clearing and farming. Students use GPS devices in small groups to complete a geocache activity around the Scott’s Bay picnic area. During this activity they search for hidden locations that relate to the history of farming in the area and identify human features that have been provided to protect the site. 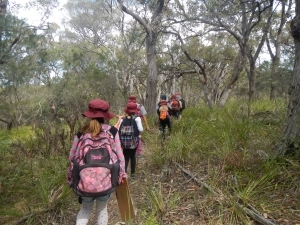 Using the skills they have learnt, students use a topographic map and GPS to locate farmland neighbouring the National Park to discuss the impacts of land clearing on the natural environment. Students create a map that would allow another student to walk to the farmland area. If time permits students walk to the cleared land to compare to the two environments. Humans shape places allows students to investigate how people influence natural places in both sustainable and unsustainable ways. The students conduct a marine debris survey and safely collect and sort debris they find in and around Wallagoot Lake. Samples of marine debris are also provided for students to sort and examine. A digital microscope is used to look for micro plastics in sand samples and this issue is discussed. Students consider the amount and type of litter and discuss how long some of these items last in the environment. Students brainstorm ways that they can reduce the impact of marine debris in the local environment and contribute positively to sustainability.